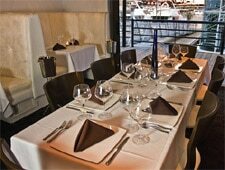 Chef-owned restaurant and wine bar in Newport's quiet Lido Marina district. : Tucked quietly away in Newport’s almost ghost-like Lido Marina district, this peaceful waterfront restaurant is steadily steered by chef Don Schoenburg and his pastry chef-wife Christi Carter, who both formerly cooked at Tradition by Pascal and Patina Group’s Leatherby’s Café Rouge. Fortunately, the couple toned down the former restaurant’s (Blanca) garish colors, yet this spot is still modern and inviting despite its location atop a historic wooden boardwalk. Yes, the space's configuration may be a bit disjointed (tiny main dining room, lots of outdoor seating, adjacent wine bar), but fortunately chef Schoenburg shines in the kitchen, with his emphasis on seafood, wild game and other delicacies like foie gras, duck confit and pork belly. Start with a well-chosen bottle of wine and then nosh on an enormous plate of international cheese and charcuterie. If you are seeking some spice, first try the chili-smoked shrimp with mango gastrique and refreshing mango sorbet. We also enjoy the squid salad, smoked fish trio and seared scallops with braised escarole, wild boar bacon, black truffle jus and Dijon mustard foam. At dinner, guests can order à la carte or try the seasonal three-course prix-fixe menu with wine pairings. The braised rabbit is a standout, with its fresh chanterelle mushrooms, asparagus tips, rabbit jus and white truffle foam. Schoenburg’s signature sautéed barramundi sits atop creamy Meyer lemon risotto. Pastry chef Carter creates sophisticated desserts like the Medjool date cake with black pepper caramel and house-made toffee triangles. The wine list features mostly California and other international selections by the taste, glass or bottle.